Couldn't ask for a better, happier traveler at this moment in time. Now we just need to work on his slightly demonic younger sister. P.S. 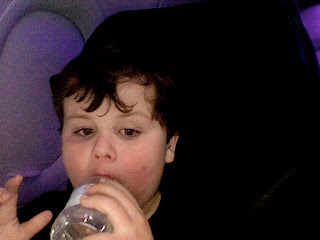 We are on the plane right now and I heart Virgin America Air. I wish you a happy happy time out there in the desert. Thrilled for all of you!! Enjoy every minute!! Yay a couple times over! @liz, she has had far too much positive reinforcement of negative behaviors from well-meaning people who are afraid to assert themselves with other peoples' children while I've been distracted with her brother. Defiance is her standard. I am not liking it. And I am feeling guilty about being so frequently distracted and allowing the monster-making to happen. Not denying she is smart. Asked her how she knew her basic mathematical operations and fractions, she learned them last year at preschool, duh Mommy! Sometimes I am very afraid of her.